It might surprise many people, but there are different types of depression and often related to the cause of the depression. What is important, no matter how you got the illness, you seek help to get better. When you look at the effect, depression has, it affects so many people worldwide and yet how it’s treated depends on so many different factors, including not admitting to a mental illness because of the stigma that many people view this type of illness. Depression comes in many different disguises, it is often difficult to notice the onset, it is very difficult to admit you might have a problem but there are times where different types of treatment help you to overcome the condition. However, the only person who can suggest or prescribe the treatments must come from your doctor. They are the people trained to help you and if they feel that you need more help from another specialist in this field, then they will offer advice as to where to seek further help. The obvious treatment you might be offered is medication, there are different types of medication and the first one you’re prescribed mightn’t be the best, you have to talk through how you are feeling with your doctor and if they feel that another medication might be better, then follow their instructions on changing your medication. Counselling is another option for depression and what many people don’t realize is how effective counselling is. You might just be talking to someone but you are also connecting your emotions and understanding how they make you feel and how to let go of the emotion. I was very sceptical about counselling until I tried it. Counselling was one thing that got me through some very difficult and emotional times in my journey with depression. Exercise is a powerful tool for treating depression, some research is even suggesting that this is just as effective, if not more so than medication. Exercise makes you feel good, it releases chemicals in your brain that help to give you a more positive and happy feeling, combating the depression. Your diet, this is so important, calories aren’t created equal and no matter how much you want to pick those bad choices, they will help to keep you in that cycle of depression. Special lights that help to fight seasonal depression. Hospitalization for medical intervention and help. One area I have found helpful is cognitive therapy, I worked through this system during my depression and found it helpful. Talk to your doctor about the different types of treatment which are available to you. Don’t be afraid to take in information because sometimes talking about depression can make you emotional and remembering all what you wanted to say isn’t always easy. If you are looking for more information on depression there are articles talking openly about mental illness. Just the same as there are different ways to treat depression there are different types of depression, some more severe than other types, but they are equally as important in seeking the right professional help. I do wonder if this isn’t what started my journey in depression, I was very young when I started my family and mental illness was not something you talked about. I don’t think it was ever brought up in any conversation I had with any medical profession with my first or even second child and when I had my third child, I answered those questions with the answers they wanted to hear and not what I was truly feeling. I think there is a fear that people will think that you are not coping and that someone might take away your child, there just wasn’t the support when I had children, I hope this has improved, but I know postpartum depression is not something to ignore or hope it will go away. This might sound like an odd description for depression, but it is probably more common than you might imagine. In those colder and darker months of winter, when we shut ourselves away from the bad weather we are reducing the amount of the natural vitamin D our bodies are absorbing from the sun. Bipolar is a mixture between the two extremes of feeling very low and periods of feeling very happy. This is when something happens in your life and it makes you feel sad and depressed for a time. Often associated with a death of a family member or even job loss can bring on this type of depression. Don’t confuse this depression with PMT, this is totally different and it does affect a lot of women and often goes untreated. Depression can do odd things to our minds including hallucinations, seeing and hearing things that are not real. This type of depression has a symptom where the arms and legs feel heavy. This type of depression is where you have depression for a long time; you can’t remember ever feeling happy or good about yourself. This is a bad case of depression; it is very serious, as the person doesn’t feel good about himself or herself. They can have feelings of suicide or self-harm, but this doesn’t always occur. Basic skills are difficult, things that you might take for granted become confusing and too much to contemplate. Depression is a serious illness and not one to take lightly. There is help available and it is important to seek that help if you have felt low or depressed for any length of time. Talking about depression is important, it helps people realize that it is not something that is bad, it is an illness and it needs treating as such. It isn’t your fault and you shouldn’t be made to feel bad about your condition. Removing the stigma that is often associated with mental illness is important, it is not something to fear and there is help. It isn’t a quick fixed illness, but there is hope and a better quality of life by seeking the help you need. Therefore, understanding that depression is a multitude of different feelings and emotions and it is not something that you should ignore. Knowing the different types of depression can help you identify with other people who are feeling the same, you are not alone. Don’t listen to people who tell you to pull yourself together, it isn’t as easy as that! It is about seeking the right professional help that will help you to get well and live the life that you deserve. What questions do you have about the different types of depression? 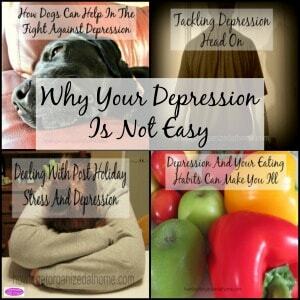 If you are looking for more articles on this topic head over to the landing page where you will fond links to other posts on depression. This is a really great post, thanks for sharing. I’m actually including this as part of a resource blog post tomorrow as it’s that good! Keep up the great work. I applaud you for writing so much about depression and how it affects every part of our lives. I’ve found all of your posts regarding depression helpful and informative. Thank you! Thank you for your kind words! It is an important subject and one that isn’t talked about often enough!